An alcoholic detective attempts to find the culprit behind a series of murders of mothers. Somehow, the internet convinced the masses that bacon is a delicious foodstuff. Come on now, it's bacon for heaven's sake. It's perfectly fine, and I enjoy a good rasher as much as anyone, but seriously folks. Likewise the fear of clowns. Thanks to a series of internet memes, we've all become convinced that clowns are scary. They're not! While a miniscule portion of the populace may genuinely suffer from coulrophobia, the rest of us wildly overplay the effect a man in pasty make-up and big shoes has on our nerves. Snowmen aren't scary either. There's simply no way to make two lumps of snow, a carrot and a few raisins terrifying, which is why the 1997 killer snowman thriller Jack Frost is such a comedy classic - it knows how ridiculous its concept is and wisely plays it for laughs. The people behind The Snowman - an adaptation of the seventh(?!) book in Norwegian author Jo Nesbo's Harry Hole (stop sniggering at the back) series - have clearly never watched Jack Frost. Their film is full of 'moody' shots of snowmen, all accompanied by ominous music. It's laughable for all the wrong reasons. Yet, that's the least of this film's problems. Not since The Counselor have so many talented people conspired to make such an absolute catastrophe of a motion picture as The Snowman. It's directed by the highly regarded Tomas Alfredson (Tinker Tailor Soldier Spy). It's based on a novel by one of the most acclaimed proponents of the literary genre that's come to be known as 'Nordic Noir'. Nesbo's story has been adapted by writers Hossein Amini (Drive) and Peter Straughan (the aforementioned Tinker Tailor). Thelma Schoonmaker, who may be the most respected editor in the history of cinema, cut the damn thing, presumably having signed on when Martin Scorsese was attached to direct. Meanwhile, the cast reads like a roster of the finest working talent of Northern Europe and the US. Leading that impressive ensemble is Michael Fassbender as Harry Hole (the Norwegian pronunciation of the surname is 'Hula', but everyone here regrettably pronounces it phonetically). Harry is an alcoholic. Well, he's one of those Hollywood alcoholics who wakes up on a park bench at the beginning of the movie and then never touches a drop of gargle for the rest of its duration. The Oslo police department (whose HQ resembles that of a hipster tech firm, all futons and table tennis) tolerate Harry because he's said to be a genius, though the movie portrays him as the worst screen detective since Inspector Clouseau. Harry's latest case sees him teaming up with a rookie, Katrine (Rebecca Ferguson), a missing persons specialist, to investigate a serial killer who bumps off women who happen to be mothers, leaving a (not remotely scary) snowman at the scenes of his crimes. Nesbo has written and sold an awful lot of books, so I'm forced to assume his version of The Snowman boasts coherent plotting and characters who behave like human beings. For some bizarre reason, that's not remotely what we get with this screen adaptation. The plot is riddled with more holes than a block of Jarlsberg cheese, with the killer turning up to murder characters in locations he couldn't possibly have known they could be found at, and Hole failing to notice the most blatant of clues as to who said killer is. Characters are introduced, like JK Simmons' sleazy politician and Val Kilmer's alcoholic ex-detective, only to simply disappear from the narrative, their seemingly important sub-plots left unresolved. Kilmer, it has to be said, is a far more convincing drunk than Fassbender, but I suspect he may have plunged a little too deep into his role. His performance is truly bizarre, and I have no idea what we're supposed to make of his character's inclusion. Similarly, I'm still wondering why the film made such a big deal over a prescription of sleeping pills without ever resolving that element. Perhaps such lack of resolution can be put down to this being an adaptation of the seventh instalment in a literary series that currently totals 11 books. Watching The Snowman often feels like jumping into the fourth season of a TV show without having seen the previous three, and the relationship between Harry and his ex-wife (Charlotte Gainsbourg) particularly plays like the climax of a long-running plotline we haven't been exposed to. 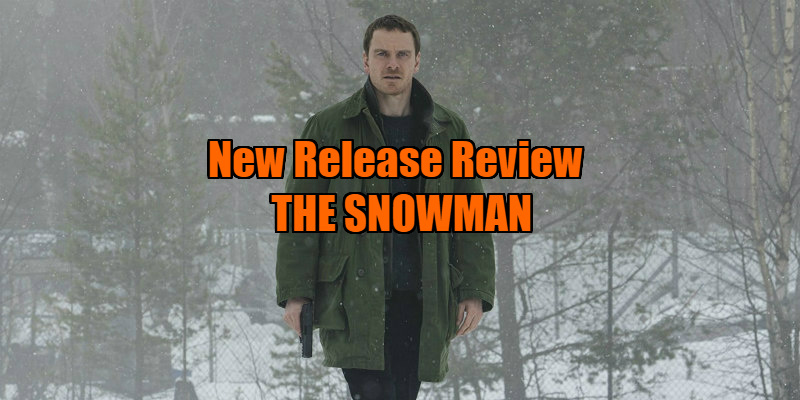 What's frustrating about The Snowman is that many of its niggling issues could easily be fixed by simply removing a couple of pointless sub-plots and a day or two of reshoots to fill in the remaining narrative blanks. The movie would greatly benefit from letting the audience know the killer's identity from the beginning, adding a touch of suspense to every otherwise innocuous scene they appear in. As it is, the climactic reveal raises more questions than answers, and is another example of that annoying trope of a killer who behaves perfectly normally until the climax, when they transform into a moustache twirler. At time of writing, The Snowman's imdb page lists Claire Simpson (an Oscar winner for her work on Platoon) as its editor, while the print I saw named Schoonmaker in the role. I can't help but surmise the producers of The Snowman believed their film could be saved in the editing bay. Simpson and Schoonmaker may be as good as their craft gets, but this is a turd even they couldn't polish. 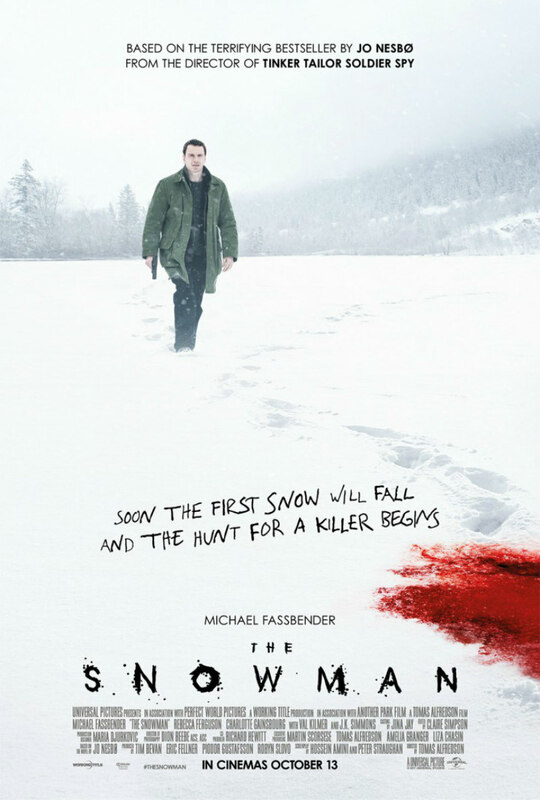 The Snowman is in UK/ROI cinemas October 13th.